Welcome to the exciting world of photography where you can explore your interests and capture great moments, right at your fingertip with your own camera. When it comes to capturing beautiful memories, protecting your camera is important. That’s why you need to find the best case or bag or backpack to hold your camera securely everywhere you go. You will never get disappointed by any item suggested in this list. Case Logic SLRC-206 has a really nice product to line up the list. It does not only hold camera but also a 15-16-inch laptop and other accessories as well making it come really handy when traveling. The SLR camera holder part can even load zoom lens, tripod, and batteries and more. The unique feature of the backpack is that it can hold the camera above the bottom of the case that gives extra protection even with zoom lens attached. This little bag just fits right to your camera in a compact size. It protects, carries, and store your camera and other small equipment just the way you want it to. From the original Canon camera brand, this bag is entrusted for a premium protection to your camera and equipment. 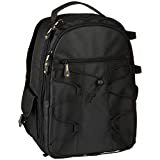 The bag can hold one or even two camera bodies, three to four lenses, batteries, and other necessities for photographers. This case is designed for point-and-shoot camera that are supposed to be small, light and easily carried over in any traveling condition. That’s why this lovely case comes with strap that you can hold on your neck. The case itself features a pocket that can store memory cards, and small accessories. The interior padding is made from nylon that is durable and protective. This is another design from Case Logic that is smaller than the previous one reviewed. The case is not to large or too small. 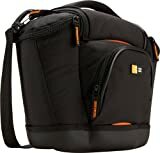 It can hold SLR camera and has sling that you can wear like a backpack but you can have access to your camera and accessories immediately without removing the case from your back like a backpack. Like its bigger backpack, it still can perfectly protect your camera by suspending your camera from touching the bottom of the case. 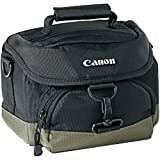 Canon 2400 SLR Gadget Bag is another cool choice for you for photography trip. The material is made of water-repellant nylon fabric. It features interior dividers that can be adjusted to your liking. That way you can make use of the empty space inside the bag. This bag can hold a DSLR camera as well as 3 to 5 lenses with front and side pockets. 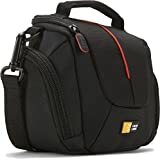 This is a medium-sized camera bag that has many pockets and dividers for the convenient storage for your camera accessories. The inside is made of memory foam interior that gives maximum protection. You can also secure your tripod or monopod to the front of the case using the easy flap and carry the bag with strap or padded handle. 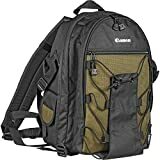 This Canon backpack once again made it to the list because of its extremely usefulness and that it can handle many things up to w2 smaller SLR camera bodies and 3-4 lenses and other accessories. It is constructed of waterproofed polyester and nylon with water repellant and urethane coat for added durability and protection. The light weight, compactness, and convenience make it a really good camera backpack. One of AmazonBasics products’ goals is to ensure the consumers with high quality product with affordable price without wasting on things that don’t matter. This affordable yet durable case is packed with beautiful design and usefulness. The orange interior makes it eye popping and the dividers inside is perfect to store your camera, lenses, flash and more. There’s even a slot for iPad Mini, Google Nexus 7 or Amazon Kindle Fire. It’s many things you need all in one. This is the number one best seller in Camera & Photo Case & bag Accessories on Amazon. Amazon always ships their products with Certified Frustration-Free packaging which ensures you get what you pay for at a very good condition. The load can handle one to two smaller SLR/DSLR and 3-4 lenses. The material is made from polyester/nylon that are durable and long-lasting. It is backed by one-year AmazonBasics warranty. Last but not least, Case Logic DCB-304 is also another best seller in Camera Cases on Amazon. It offers low price but high quality. It features hybrid and high zoom camera holders, flex wall that separates camera and accessories, zippered pocket that stores memory cards, belt loop for carrying the case, and side zippered pockets for extra storage. All these things matter when you travel and you definitely need a good bag like this with you on the go.